Once an age, a mythic wind lifts the veil between the spirit world and ours. Whimsical seraphs, drawn to the vigor of an ancient forest, descend through clouds to once again take up their centennial game. You are one of these seraphs � a being of great power and curiosity. The life of the forest fascinates you, and you eagerly gather plant, animal, and sprite alike to add to your mystical menagerie. But beware, for you are not alone. Other beings just like yourself contest to collect the life of the forest as well! In Spirits of the Forest, players represent the four elements that nourish the forces of nature. Up to four players compete to acquire the most (of nine different) spirit symbols, which are bound to a different element of nature. 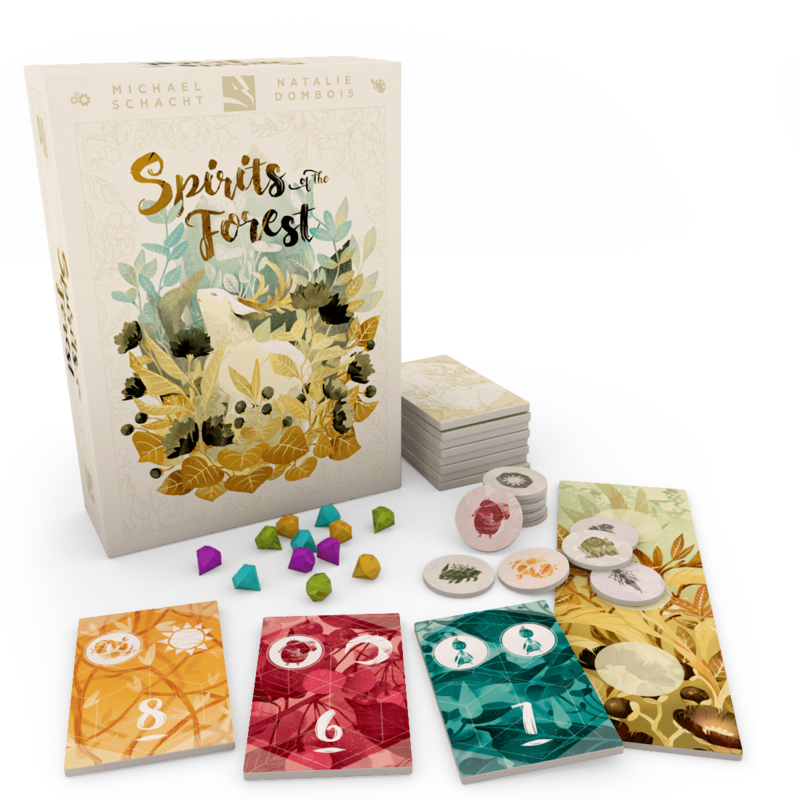 Each turn, a player drafts up to two spirit tiles from the forest (a common pool of 48 spirit tiles), collects favour tokens, and moves, places, or recovers gemstones. Players continue taking turns until all tiles have been collected from the forest. At the end of the game, players score nature points for each spirit (augmented by favor tokens) of which they have a majority. Whoever has the most nature points at the end of the game wins.